For years, scientists and politicians have warned of the effects of global warming on the environment. Specifically, America is starting to experience more storms and bad weather. Warm air holds more moisture, so as air temperatures rise from year to year, we will continue to see more rain and flooding. According to the National Climate Assessment, the intensity, frequency, and duration of hurricanes in the North Atlantic have all increased since the early 1980s. And future projections of climate change reports hurricane intensity and rainfall will increase as the climate continues to warm. Physical issues like flooding aren’t the only problems caused by global warming. There is also a lot of money at stake. Insurance firm Swiss Re Grouppredicts that weather-related disasters will cost the American economy $150 billion a decade from now — more than double what it requires now. And the Federal Reserve Bank of New York’s 2017 Report on Small Business Disaster-Affected Firms found that 40% of small firms within Federal Emergency Management Agency (FEMA) designated zip codes reported natural disaster-related losses, and of that 40% of small businesses never recover from a disaster. 35% had losses in revenue over $25,000. 19% had losses in assets over $25,000. Firms affected by natural disasters were more likely to report revenue losses than asset losses. If you’re in the property restoration industry, you’re well aware of how climate change impacts home value and business profitability. But have you ever thought about how this climate change could affect your own business? If not, you should. Business continuity is a fancy term for risk management. Business continuity is the art and science of looking ahead and making sure your business is positioned to continue operating when storms and other disasters strike. First, let’s clarify that business continuity is not the same thing as disaster recovery, but they are often used interchangeably. When it comes to business continuity vs. disaster recovery, as the name implies, disaster recovery is reactive, and business continuity is a proactive solution. Business continuity includes the processes and procedures it will take to ensure there are no interruptions in regular business operations during a disaster. But disasters happen, and you may not have included every scenario in your business continuity plan. In that case, you need disaster recovery, a part of your business continuity plan, to restore vital support systems like communications, hardware, and IT assets as quickly as possible to minimize business downtime. 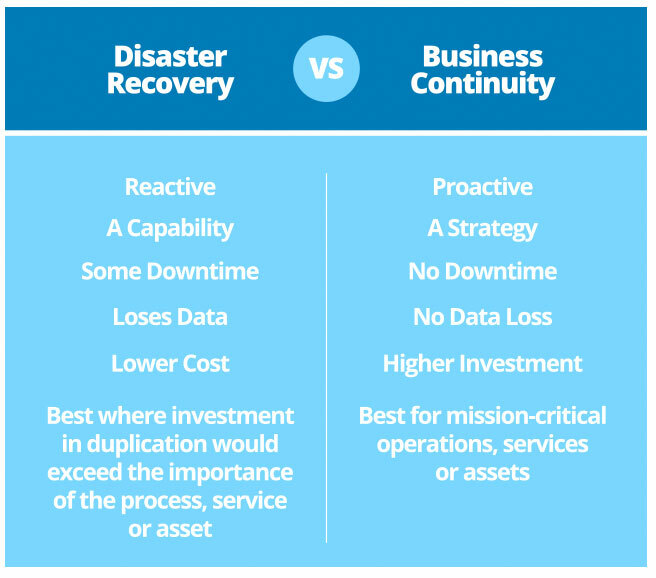 The chart below lists some other distinct differences between business continuity and disaster recovery. And while there are differences between disaster recovery and business continuity, you don’t have to choose one over the other. It’s more about making them work together to reach the most critical goal: protecting your business. As you can see from this chart below, your business continuity and disaster recovery need to work with your infrastructure, plans, and processes for an “always-on” business. This is where DASH restoration software comes in to play. DASH is cloud-based software, which just means it’s a software that provides its computing service through the internet. DASH is a workflow management tool that you can use to create job schedules, manage your project, track your budget, communicate with clients, monitor the status of your projects, maintain equipment, and keep notes for a particular project. And because this business management tool is built on a cloud-based platform, all of the information can be accessed from anywhere with internet access. So how does this help you in the event of a storm? More than 10,000 manufacturing facilities were forced to close, and more than 8,100,000 homes lost power in 2012 because of Hurricane Sandy. As a disaster restoration company, you can’t afford to be out of business when disaster strikes. But, if you have restoration business management software like DASH, that won’t be a problem. By moving all of your company’s vital information to DASH, you can access it directly from your phone or laptop. This means that if the power goes out in your office, or if flooding prevents you from making it to your office, you can still do all of the work you need to from home or even your car. Think about the setbacks your company would face you weren’t able to work for some time because of a storm. Now think about the competitive advantage of being able to work when other restoration businesses can’t. All it takes is a little water damage to hurt your business in a big way. If your office floods and damages your accounting notebook, or wipes out the computer with all of your contacts, you’re in trouble. With a DASH restoration software, all of your company’s most important information is kept in the cloud to lower the risks of a storm destroying that information. 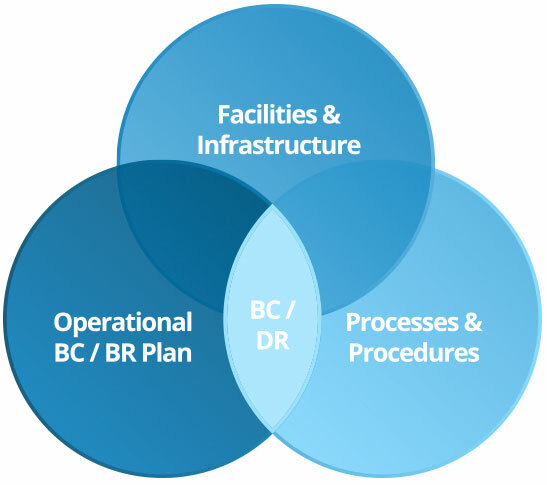 The name of the game is business continuity. You want to do whatever it takes to keep your restoration business operational. It is estimated that Hurricane Sandy alone cost businesses $25,000,000,000. With a rise in storms expected in the U.S. in the near future, it is imperative to prepare your company for the worst so that you can stay in business and continue to grow your company. 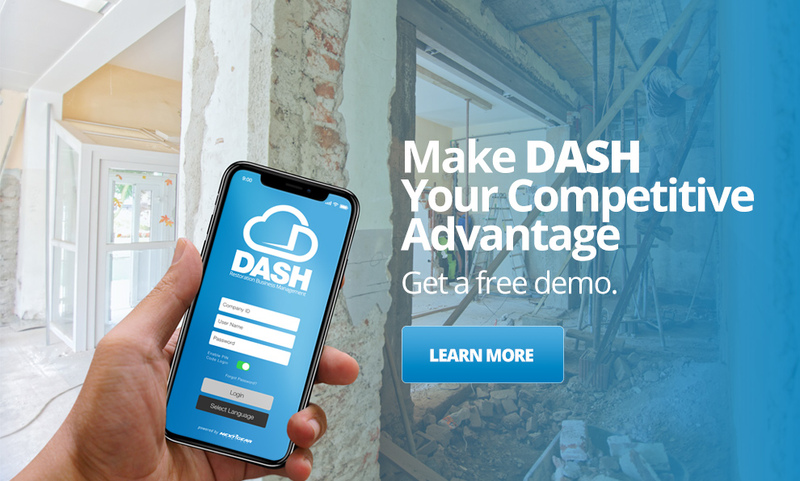 You remove a lot of the risk a storm poses when you place your restoration company’s most valuable information into DASH’s cloud-based platform. DASH restoration software is a significant first step in minimizing the risk that storms pose. When storm clouds roll in, trust your business to cloud-based software.